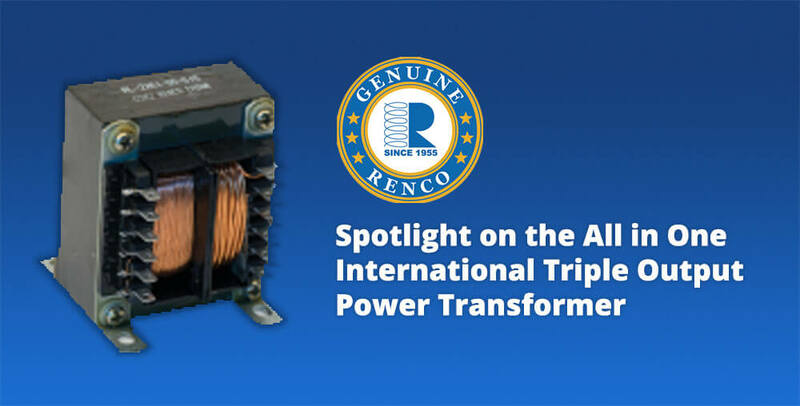 Renco All in One International Triple Output Power Transformers - Chassis Mount » Electronic Salesmasters Inc.
RL-2261 Series International Power Transformers are manufactured to meet UL, CSA, VDE and IEC specifications. These transformers with chassis mount capability are available in ratings of 25 VA, 43VA and 80 VA. Designed with dual primaries (115/230V – 50/60Hz) and input range of (100V to 130V or 200V to 260V -50/60Hz) and triple outputs (5VDC with ±12VDC or 5 VDC with ±15VDC). The split bobbin construction eliminates the needs for electrostatic shielding. HIPOT tested at 4000VRMS. Renco Electronics’ standard transformer offering consists of over 20 different product families in molded, encapsulated, vacuum impregnated or open construction with vertical or horizontal layouts and printed circuit, chassis or surface mount foot prints. Their extensive power ratings from 1 VA to 175 VA and input voltages from 120 volts to 230 volts gives customers a wide variety to choose from. 50/60 Hz, 47 Hz to 400 Hz or 100 kHz transformers in low profile packages are their specialty. Power, current sense, gate drive, and flyback transformer designs available. All of Renco’s transformers are UL approved or designed to meet UL Class B 130 Celsius or better and are lead free RoHS compliant. CSA, VDE and IEC transformer requirements are meet with consideration if needed. If you don’t see something that will meet your needs, they can design a custom transformer or modify one of their standard transformers. ESI is the local representative for Renco, a leader in the design, manufacture, and worldwide distribution of transformers, inductors, chokes, and coils. Renco designs and manufactures transformers and inductors using surface mount, through hole, and chassis mount technology.